When a Colorado doctor suffered a precarious illness far from home, his CU and UCHealth families jumped into action. They had gone to the beach, watched colonies of sea lions, fed koalas and pet wallabies over a lovely couple of days on Kangaroo Island off the coast of Adelaide, Australia. The Meguids, back home together in early March. From left, Natalie, Rob, Cameron and Cheryl. It was the afternoon of Dec. 23, and Dr. Robert Meguid, his wife Cheryl, and their two young children pulled into a supermarket to stock up for the next couple of days. With Christmas Eve, Christmas and Boxing Day coming up, things would be closed. A man with a cold, Cheryl thought. Not a big surprise, really: she’d missed her last day of work before the big two-week family trip with a nasty one, and the kids, Natalie, 3, and 11-month-old Cameron, had come down with it, too. It was Rob’s turn, she supposed. Both Rob and Cheryl work in the University of Colorado Department of Surgery and practice at UCHealth University of Colorado Hospital, he as a cardiothoracic surgeon, she as and director of multidisciplinary programs for the department. Rob ceded the wheel to Cheryl despite her having never driven on the “wrong” side of the road. He went straight to bed when they got back. Later, he was coughing enough that he and Cheryl agreed she should sleep in the other bedroom with the kids. At 6 a.m., just as the sun came up on Christmas Eve, pounding on the wall woke her up. Her husband yelled something. She went to check on him. He was coughing up blood. He couldn’t catch his breath. His fingers and toes were numb. This doctor wasn’t thinking about a diagnosis. He was thinking: I’m in shock. “I need to go to the ER,” he rasped. Cheryl roused the kids. Rob staggered out to the car. Cheryl drove a right-hand-drive vehicle for the second time in her life, this time tearing across 50 miles of Kangaroo Island at 100 mph. They arrived at Kangaroo Island Health Service hospital at about 7 a.m. Rob walked straight past the emergency room front desk into the back. His skin had gone gray; his lips were blue. Quick tests confirmed that his lungs were failing and that other oxygen-starved organs – this despite now being on oxygen – weren’t far behind. Another doctor, Jeremy Wells, gave instructions to the others over the phone as he rushed in from his home in the village. Cheryl gave Rob a kiss before they sedated and intubated him. Within an hour of his arrival, he was gone – airlifted to Flinders Medical Center in Adelaide. Cheryl watched the helicopter disappear in the sky. It was 8 a.m. the day before Christmas. Her husband was mortally ill. They had flown here from Melbourne. She didn’t know where Adelaide was. She was 9,000 miles away from home with two young children on an island named after a marsupial. But right then, the first of many, many benefactors would come to the Meguids’ aid. Nigel Jefford, director of nursing at the Kangaroo Island hospital, drove Cheryl and the kids the 50 miles back to the bungalow, kept an eye on Natalie and Cameron as Cheryl packed suitcases, and drove them all the way back and on to the car ferry. On the ferry, a retired nurse, Geraldine Headley, overhead Cheryl explaining her predicament and offered to drive her and the kids to the hospital in Adelaide, where they lived. Her husband would pick them up. By 3 p.m., Headley had walked Cheryl and the kids up to the hospital’s third floor, where Rob lay unconscious and intubated in the Flinders Medical Center’s medical intensive care unit. He was already on dialysis for his failing kidneys. The working diagnosis was severe pneumonia that had cascaded into acute respiratory distress syndrome (ARDS) and septic shock, though what bacteria or virus was causing it wasn’t clear. The combination put the 42-year-old’s chance of survival at perhaps one in 10. Rob’s cousin, Matt Perfect, with whom they’d stayed in Melbourne before flying to Kangaroo Island, had already flown to Adelaide and was waiting for Cheryl at the hospital. He would stay for four days, getting Cheryl and the kids set up in a little house he had rented for them across from the hospital. Others farther afield were already in the loop. Among them were Rob’s CU colleagues Dr. David Fullerton, Dr. Michael Weyant, Dr. John Mitchell and Dr. Richard Schulick, the department chair. One of the first calls Cheryl made, though, was to Dr. David Kuwayama. Kuwayama is a CU vascular surgeon practicing at UCHealth. But he’s also an old friend. He and Rob got to know each other in 2002, when they started their surgical residencies together at Johns Hopkins. They stayed close during their fellowships on opposite sides of the country, Rob at the University of Washington, Kuwayama at Dartmouth, where he specialized in vascular surgery. Soon after Rob arrived at the Anschutz Medical Campus in 2012, he alerted Kuwayama to an opening for a vascular surgeon. Since then, they have collaborated on surgeries and climbed mountains together. David Kuwayama, left, and Rob Meguid have been close friends since their surgical residencies in 2002. 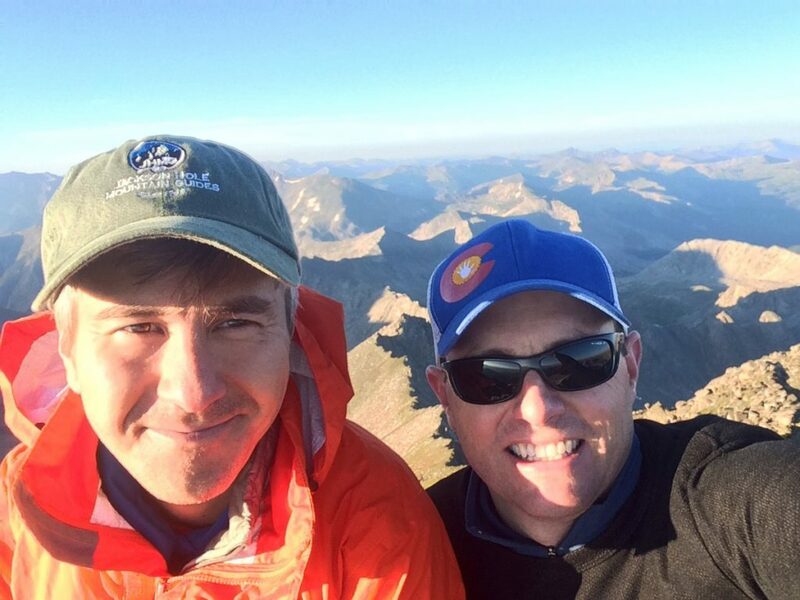 Here they are atop Blanca Peak, the fourth-highest of Colorados fourteeners, in 2016. Kuwayama, a frequent Doctors Without Borders volunteer, is used to traveling great distances to take care of people. He booked a flight to Australia. Meanwhile, Cheryl was in daily contact with Kuwayama and others in Colorado. She took cell phone photos of X-rays and CT scans and texted them to Mitchell and Weyant, Rob’s thoracic surgery partners. The providers at Flinders Medical Center, a 600-bed academic hospital, did their job well; the Colorado doctors provided remote support, looking after one of their own. Meguid’s mother, Victoria, arrived on December 26. By then, pain in Natalie’s ear had been diagnosed as a perforated eardrum caused by a Group A Streptococcus infection. This was, they would learn, the same bug that had invaded her father’s lungs (Cheryl ended up with strep throat, too). Rob was stable enough by December 30 that doctors let him wake from the sedatives and removed the breathing tube. Cheryl told him he had been out for a solid week. He couldn’t believe it. Wearing an oxygen mask and still connected to IVs, they wheeled him outside to a courtyard. It still could have gone a different way. As the last night of 2017 turned into the first morning of 2018, Rob’s blood oxygen levels sank. Cheryl, at his bedside, “was trying to get me to breathe,” Rob said. He desperately wanted to avoid being put back on a ventilator. “I was afraid the second time around I wouldn’t survive, because I was lucky I had survived the first time,” he said. It had to happen, this time with a tracheostomy – a tube through the throat. The dialysis continued. Cheryl spent days at her husband’s bedside. Geraldine Headley, who had driven Cheryl and the kids to Adelaide, reached out to friends, who reached out to teachers on summer break. They took turns taking Natalie and Cameron to the beach, to the pool, to the zoo and to the park. A former patient and now friend of Cheryl’s, Cheri Foss and her husband Michael paid for Cheryl’s sister Sharon’s flight so she could be there to help. On January 4, Kuwayama arrived with presents for the kids, who were about to turn one and four. His personal mission was to get his old friend back to the U.S. and to University of Colorado Hospital. 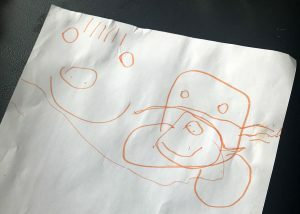 Natalie, who turned four when her dad was in an Adelaide, Australia intensive care unit, drew him as she remembered him, left, and with the accessories of an ICU patient. Photo courtesy of Cheryl Meguid. It would take another nine days. Rob’s condition was slowly improving, but there were setbacks, including a spiking fever and a whole-body rash – reactions to an antibiotic. They worked on getting a life flight back to Denver. Sarah Kabat, UCHealth’s director of International and Executive Health Services, stepped in to help with arrangements. Kuwayama plotted out the eight-seat Cessna Citation’s path back to Denver and the timing of refueling stops – in New Caledonia, American Samoa, Honolulu and San Francisco. He touched base with ICU staff at The Queen’s Medical Center in Honolulu and UCSF Medical Center, who had ICU beds and dialysis machines ready in case Rob’s condition deteriorated on the flight. When the life-flight company needed $198,000 immediately, including a $9,500 processing fee, UCHealth CEO Elizabeth Concordia approved transfer of the processing fee, while Rob’s mom raided her retirement savings for the balance. Rob’s father, recovering from pneumonia himself, arrived to see his son just before he left Adelaide. On Jan. 15, Rob was stable enough to fly. His mom accompanied him, a flight doctor, two nurses and two pilots on the life flight. Cheryl and Kuwayama monitored the flight’s progress. During the final leg, Kuwayama noted that weather was diverting Denver-bound planes to Cheyenne, Wyoming, so Cheryl asked UCSF Medical Center to keep that ICU bed open just in case. The Cessna landed at Denver International Airport 24 hours after it left Adelaide. An ambulance brought Rob straight to the cardiothoracic ICU where Rob’s own patients often go after he operates on them. Fullerton led the care team; he had help from Dr. Scott Wolf, Dr. Karsten Bartels, Dr. Erik Peltz and Dr. Martin Krause, MD, as well as numerous other specialists enlisted to help manage Rob. Two days later, Rob’s kidneys had recovered enough that he was off dialysis, and the ventilator gave way to an oxygen cannula after about a week. The rash had subsided after dermatologists made a diagnosis and initiated steroids. One new complication was pancreatitis, probably from the lipid-based sedative propofol, which Rob had been on for so long. 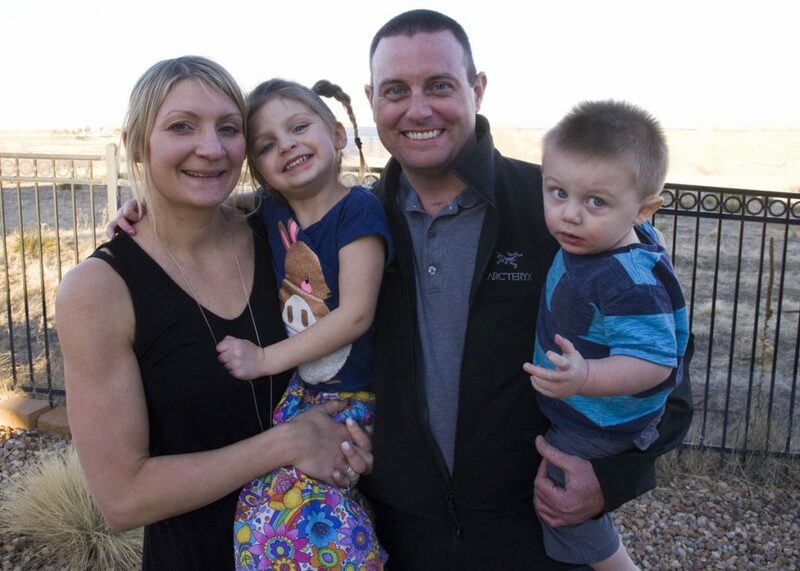 .Rob continues to gain strength at home with the family and expects to be back in the OR in early April. From left, Cheryl, Natalie, Rob and Cameron Meguid. As Rob got better, the stream of visitors was welcome and unremitting. Kuwayama brought him rich homemade soups to help put back on some of the 35 pounds Rob had lost. Dr. Pamela Lipsett, a mentor during his residency at Johns Hopkins, set up a CarePages.com page to lighten the narrative burden piling up in Cheryl’s inboxes. Tamara Mayne, a nurse who runs the cardiothoracic OR service, set up a list for volunteers to provide meals and babysitters for Cheryl while Rob was still hospitalized. In the ICU, nurse Gail Balbier, was there to “talk me out of my drug-induced irrationality” and lift his right leg, which had ended up with sores and nerve injury from the long flight back home, back onto the bed (to him, it felt as heavy as cement). Another nurse, Hailey Pash, arranged for Rob’s first shower in a month, which he described as “one of the most incredible sensations of my life – I’m not joking.” She also arranged for Rob to see his kids in an unused hospital conference room, since they were too young to visit him in the ICU. After he got home, the help didn’t stop. Surgical residents, Dr. Jason Samuels and Dr. Allie Halpern, Halpern’s husband, Joey, and former surgery residency program manager Michael Benge organized a fundraiser at a Colorado Avalanche hockey game followed by a silent auction at a local brewery. The guys either play or played with Meguid, a goalie, on the Department of Surgery’s team, The Ten Blades. At the Meguid home on a Saturday afternoon in early March Natalie played with a cadre of Beanie Boo dolls as Cameron exploited his bipedal mobility, pinballing about the first floor. With a little dog named Monkey pressed up against him on the couch, Rob looked the same as ever, save the short purple scar at the base of his neck. He was still down 25 pounds of muscle, but was rehabbing hard, his right leg the laggard. When he got home from the hospital, he had set April 2 as the date he would return to clinical work. He was, at the time, not ready to power through the hours-long, complex-surgeries he specializes in at UCH. As of early March, Rob was on track to meet that April goal, already spending time at Anschutz interviewing fellowship candidates and doing nonsurgical office-related work. Cheryl had fetched Cameron and had hoisted him to her hip.